Refinishing ceramic tile is less expensive, more green, and adds more vitality to your existing tile! Refinishing ceramic tile is less expensive than replacement, more green, and adds more vitality to your existing tile! Miracle Method refinishes ceramic tile in much the same way that we refinish ceramic bathtubs and kitchen countertops. Painting ceramic tile is completely different from refinishing ceramic tile. With refinishing, the new finish is actually fused or bonded to the old surface. Painting ceramic tiles is a cheap solution involvingspray cans of enamel or roll-on epoxies, but the effort is seldom worthwhile. These epoxies and enamels tend to look somewhat opaque or murky and are textured unlike smooth tile. Replacing tiles and reinstalling new tiles is a costly, wasteful process that involves tearing out the old time and putting new tile right back in, often taking days and resulting in excess waste in landfills. Having a professional refinish your ceramic tiles is the best possible solution. Refinishing is less expensive than tile replacement and can save a customer an average of 50%. At Miracle Method, we implement a multistep process to clean and repair your tiles before we even begin refinishing them. And refinished tilelook much better than painted tile and will last 15 to 20 years or more! Our Natural Accents finishes provide customers with the look of stone. The finish is heat resistant and scratch resistant. Refinishing also gives the added benefit of completely sealing the grout, making it much easier to clean and dramatically reduces staining and growth of mildew! 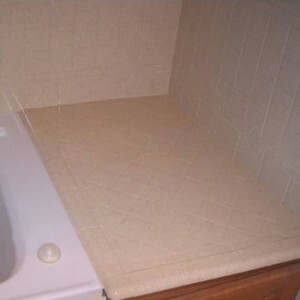 Miracle Method provides free estimates for ceramic tile refinishing so please give us a call today at 855-212-7337. I am happy to have found this information about ceramic tile refinishing. It is good to know that replacing tiles and reinstalling new tiles is a costly process. It would be best to point ceramic tiles for a cheaper solution. It would be best to seek professional help from someone who is experienced and who can complete the task for a price within your budget. We can absolutely save you time and money when it comes to upgrading your ceramic tile. To obtain a free estimate contact the franchise nearest you. You can find their contact information on our website. Go to http://www.miraclemethod.com and click on “Find Your Nearest Miracle Method” or you can reply with your zip code and we’d be happy to provide the contact information for you.